This magnificent 17th century palace of Gondal is one of the spectacles in the city. We have already got a glimpse of this palace in the earlier post on Naulakha Palace. 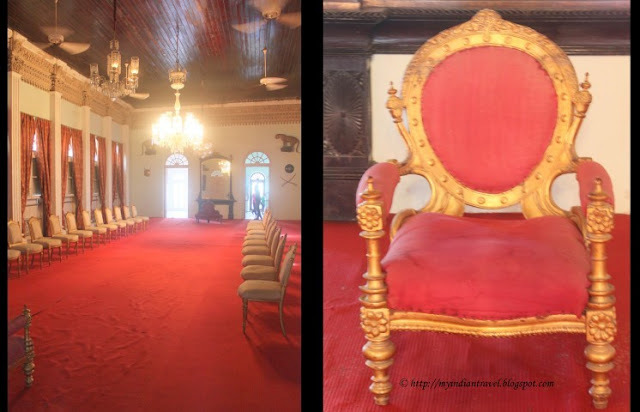 A glimpse of royalty can be seen as the former living quarters of the palace has been converted into a private museum. One can also see here the private library with large collection of books used by the the royal family. The grand Darbar Hall simple yet beautiful with gilt wooden furniture, chandeliers, stuffed panthers and antique Belgian mirrors. 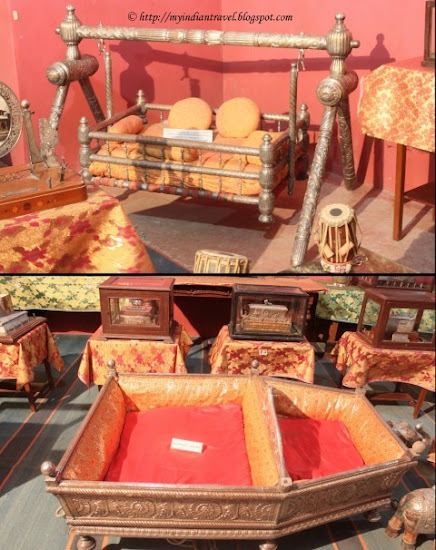 Other interesting items on display are the the baby crib, musical instruments, elephant hauda and many more items. In other section where there are items used by the kids such as cot, chair, mirror, cupboard are on display. The library looks well stocked! All so nice and interesting. I love those little furniture. That bed is like coming from the story of the three bears.Thank you for sharing this! Wonderful! So many interesting things to look at. I bet it is a great museum. Hello, what a great tour of the palace. I like the children's furniture. Great series, enjoy your new week! Looks elegant overall! Neatly preserved items... cute kids section. Lovely photos! I, too, thought the baby crib was interesting! Have a grand day! Very interesting and beautiful place! Love the Royal Family's library! Oh, what a delightful, colorful place, Rajesh!! And your captures are wonderful!! Next best thing to being there myself!! Thank you as always for sharing your world!! I hope you have a great new week!! Wow look at those books and wood furniture...I love antiques and these are so special especially the crib and kids furniture. So glad you shared these. It is always fun to get an idea of how they lived! Quite an insight into royal life. I love the library and the shelvings. What an exquisite place. It's strange to think of the people who once lived there. I would love to have a bookcase and some good books like that. Nice find and lovely photos! Lovely place - looks rather modern. GREAT post about a GRAND Palace. I'm Curious to know the Royal Family's taste in literature. Oh how lovely ~ wonderful collections you have shared! Such a GRAND palace with all of the books and GILT furniture. I covet the book cases. Beautiful Glimpse of a historical palace. Grand and gorgeous. The kids's furniture looks so unique and super cute.